Life can be quite challenging a times, and sometimes all we need is a little dose of some kind of positivity to enable us keep going or help us get through all we are being faced with. And what better way to stay positive during those times than to meditate on God's promises for us through his word. 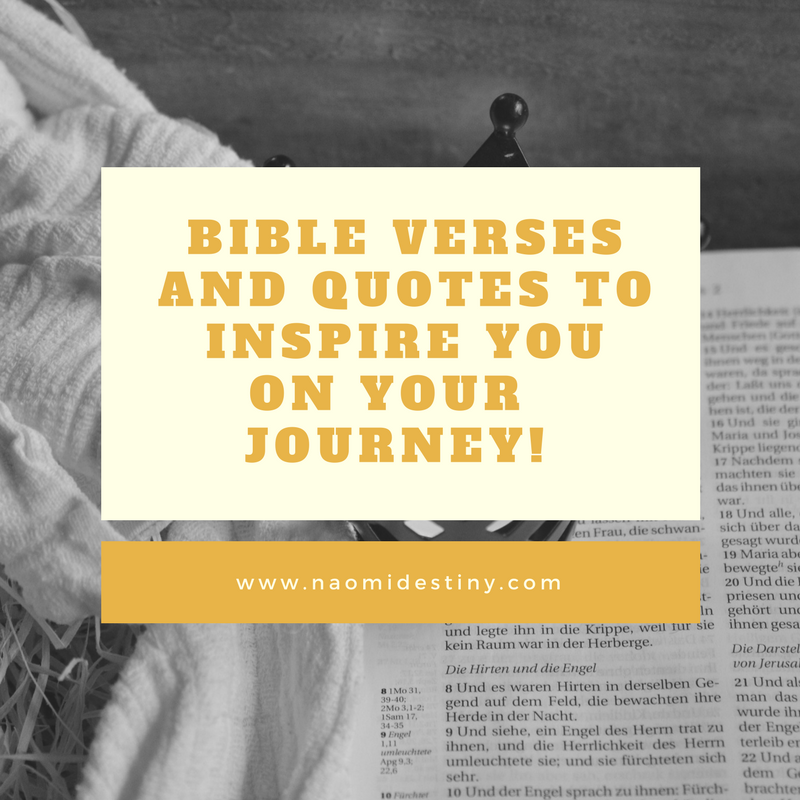 Here are a few of the bible verses and quotes that are inspiring me right now on my life's journey! I have set the Lord always before me; Because He is at my right hand I shall not be moved. Though its waters roar and be troubled, Though the mountains shake with its swelling. The Lord is my strength and shield; my heart trusted in him, and I am helped; Therefore my heart greatly rejoices, And with my song I will praise Him. And Jesus increased in wisdom and stature, and in favor with God and men. Many are the afflictions of the righteous, But the Lord delivers him out of them all. He guards all his bones; Not one of them is broken. Whenever I am afraid, I will trust in You. In God (I will praise His word), In God I have put my trust; I will not fear. What can flesh do to me? Great post and quotes, very inspiring! AMEN! Thank you for reading.. I'm glad you are inspired by this, thank you! Yeah I agree with you Tanvi! The right words during hard times brings hope...thank you for reading! I'm not a bible reader but I can see how this resonates with some people. Having, hope, inspiration during times of stress etc. is a great thing to have. Ohh yeah! Thank you CrunchyDee! I am not religious but I do understand why people turn to religion in order to find strength. And that is totally ok, as long as there is something that you feel it guides and inspires you. Thank you for reading Joanna! These are very interesting and inspiring to read even if I am not overly religious. I believe in good morals, peace and love generally and quotes like this do have such a meaningful, powerful and beautiful message to them. I try to use bible verses as ammunition when I'm in stressful or fearful situations. My favorite is not actually on your list. Phil 4:13 - I can do all things through Christ who strengthens me. That helps me to know - I can do anything I put my beautiful little mind too. Yeah Erica! Philippians 4:13 has been one of my greatest anchor! I agree with you TexanMama, Psalms has thousands of uplifting and encouraging words. John is also a great book of the bible...thank you for reading! Much love! I'm not a very religious person, but there are certain quotes, mantras, & affirmations that I like to read. I try to read affirmations from my vision board every day. Affirmations are great too! It builds me up in certain areas...I think you should try reading some books of the bible...especially Psalms. It will inspire you! Number 5 sounds like something I really need to repeat to myself more often! I liked reading others too, I haven't heard most of them before. Thanks! Thank you for reading Ana! Psalms 16:8 has always been one of my favorite verses. As long as the Lord is before us we cannot fail! These quotes are really inspiring. We don't have a lots of opportunities to come across them on internet. Thanks for sharing! Glad you found them inspiring! Much love! I particularly love number 5 the one about peace! Very inspiring, and a good reminder! Awwwww...number 5 reminds me to keep calm always. Thank you for reading Berangere! These are really inspiring bible verses. I love this verse Psalms 56:3-4 whenever I am afraid I trust in god. God strengthen us! Yeah...He is our strength and our hope! Thank you for reading Shubhada! Thanks for this. Pinned for future reference. I always look for verses to read when i'm in different situations so this list will help. Glad you found them helpful Tee! This is so great to read on even though we dont practice it but they really give us strength. your post actually moved me to subscribe to your blog. this was so needed for me today - each and every one of these speaks to me on a different level. Faith is such a beautiful thing! Awwwww Tara...thank you! Faith is indeed a beautiful thing, glad it really spoke to you! Much love! Really inspiring quotes. I always read bibles and I love it. It motivates me also to do our daily task. Very good reminder. Thank you Elizabeth! The bible inspires and motivates me a lot, glad it does the same to you too. This is a very unique and beautiful post. I really feel like any one of these bible verses can speak to and touch someone. I agree with you Candy! Thank you for reading! And oh...I so much love your blog.. I love the quotes Naomi! Thank you so much. This gave me a push this morning. I clearly see growth in what you're doing. Keep it up!